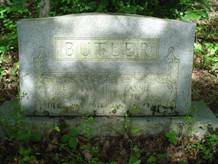 The Hardwick or Butler Cemetery is encompassed by private land in southeast Wayne Co. It is completely overgrown with only about three readable grave markers. There are several graves marked with fieldstones. As noted below, I did not find or could not get information for four of the listed names that were listed in the original survey & in the Wayne County Cemetery Book. Those names, dates and information are in italics. Hardwick, E.B. ; b. 1829, d. Dec 1886 (information from cemetery book). Hardwick, J.A. ; b. 26 Sep 1857, d. 26 Sep 1887 (information from cemetery book). H_________M.E. ; no information (information from cemetery book). Olive, Selida J.; b. 16 Dec 1859, d. 01 Nov 1862 (death date from cemetery book, part of stone with death date is missing).